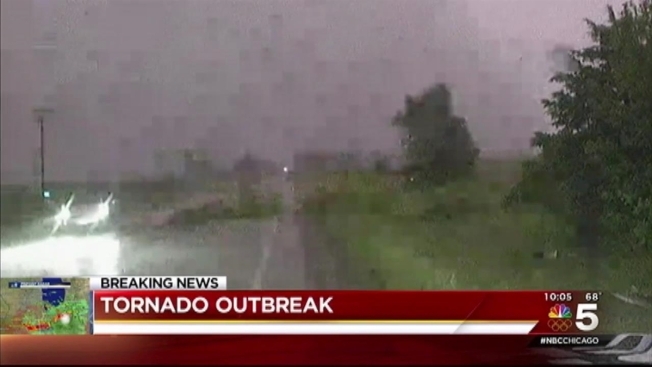 The National Weather Service issued multiple warnings for the Chicago area as much of the region faced severe weather conditions and "explosive" storms Wednesday night. Tornado Warnings were issued for multiple areas, including LaSalle, DeKalb, Lee, Livingston, and Grundy Counties, but have since expired after numerous tornado touch-downs were reported. Several counties were placed under a Tornado Watch just after 6 p.m. The watch included Livingston, Ford, Iroquois, Will, Kakakee, Grundy and Kendall counties in Illinois and Benton, Newton, Jasper, Porter and Lake counties in Indiana. The Tornado Watch issued for Cook, Kane, and DuPage counties was canceled around 9:45 p.m., but for the rest of the area, it remained in effect until 1 a.m. Thursday. A Severe Thunderstorm Warning was issued for Cook County in Illinois and Lake County in Indiana, and was in effect until 9:45 p.m. Will and LaSalle counties were also under a Severe Thunderstorm Warning until 9:15 p.m. and 10 p.m., respectively. Hot temperatures mixed with the high moisture coming from the Gulf Coast are the ingredients that fueled the formation of strong storms that developed early Wednesday evening after hours of dry conditions, forecasters said. More than 60 million people were at risk for severe weather across the Midwest Wednesday with heavy downpours and baseball-sized hail. A Flash Flood Watch went into effect at 10 a.m. Wednesday, through 1 a.m. Thursday for Cook, DeKalb, DuPage, Grundy, Kane, Kankakee, Kendall, LaSalle, Lake McHenry and Will counties. Thursday will begin with a few scattered showers in the morning before becoming partly sunny, breezy, cooler and less humid in the afternoon. Highs are expected to be in the mid to upper 70s. Beautiful weather returns heading into the weekend Friday. The day will be mostly sunny and seasonably warm, but humidity remains comfortable with highs in the low 80s.